The Vice President for Mission Integration complements the President in promoting Misericordia's Catholic and Mercy identity in University culture, policies, and practices. The Vice President for Mission Integration assists the President by promoting and supporting the University's planning process and the development of policies and programs to ensure that they are consistent with the mission of the University. The Vice President for Mission Integration provides leadership, oversight and stewardship for all aspects of Campus Ministry, the Ruth Matthews Bourger Women With Children Program, and the University Initiative for Compassionate and Mindful Living. The Conference for Mercy Higher Education unveiled the hashtag Make Mercy Real rollout for the Jubilee Year of Mercy. The institute encouraged the participation of colleges and universities in this year long effort. 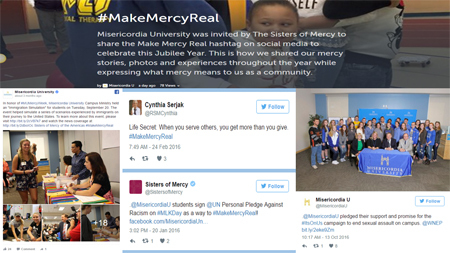 Misericordia University utilized #MakeMercyReal throughout 2016 through its social media and compiled a Storify feed of the various posts. Click here to view the 2016 #MakeMercyReal Storify! All Sisters of Mercy worldwide trace their roots to their founder, Catherine McAuley, an Irish Catholic laywoman. Catherine recognized the many needs of people who were economically poor in early nineteenth century Ireland and determined that she and women like her could make a difference. Spending her inheritance, she opened the first House of Mercy on Lower Baggot Street in Dublin, Ireland on September 24, 1827, a place to shelter and educate women and girls. Catherine's original intention was to assemble a lay corps of Catholic social workers. Impressed by her good works and the importance of continuity in the ministry, the Archbishop of Dublin advised her to establish a religious congregation. Three years later on December 12, 1831, Catherine and two companions became the first Sisters of Mercy. In the 10 years between the founding and her death, she established 14 independent foundations in Ireland and England. Click here to read about the complete history of the Religious Sisters of Mercy. 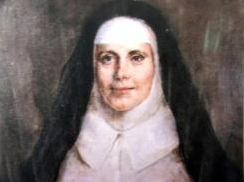 Visit Mercy International Association's website to read more about Catherine's life and the Cause to Canonize her. The first Sisters of Mercy arrived in the United States from Ireland in 1843 at the invitation of the Bishop of Pittsburgh, Pennsylvania. Their energy in ministering to the sick and economically poor attracted so many new members that by 1854, Sisters had come from Ireland to settle in New York, New York; Chicago, Illinois; Little Rock, Arkansas; and San Francisco, California. The sisters spread across the country and establishing schools and hospitals. Since then, the works of Mercy have expanded to embrace education, health care, pastoral, and social services in hundreds of sites today. The Religious Sisters of Mercy were founded in Dublin in 1831. The Sisters vowed to be of service to the impoverished, sick and uneducated. The Sisters of Mercy came to the Wyoming Valley area of Pennsylvania in 1875, continuing their mission of praying, teaching and caring for the sick. The Sisters quickly established a school for children and soon after, a night school for adults in the established coal mining region. Having secured a strong foundation of Catholic education, the order recognized that a great need was still waiting to be met. 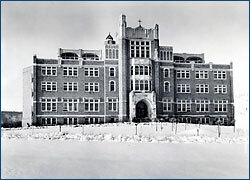 On August 15, 1924, the Sisters of Mercy established Luzerne County's first four-year institution of higher learning, College Misericordia, on nearly 100 acres of land in Dallas, Pennsylvania, purchased by the Sisters for this purpose in 1914. 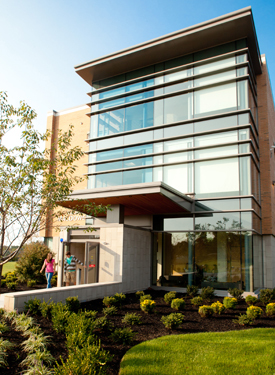 More than 2,500 people witnessed the dedication of College Misericordia (whose name means “heart of mercy"). That September, 37 students began their studies sharing the Sisters' motto: Mulier Fortis, valiant women trained in scholarship and spirituality. 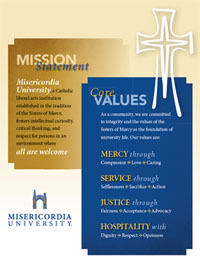 Misericordia was founded as, and continues to be as a university, a broad-based liberal arts and pre-professional studies institution offering superior education to those of all faiths. The university has been co-educational since the 1970s and offers graduate programs as well. 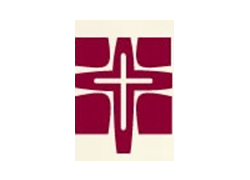 Click here to visit The Institute of the Sisters of Mercy of the Americas website. The Sisters of Mercy were founded out of a deep concern for persons who are poor. Today, that focus is in five “critical concerns" that we address through prayer, attention to personal, communal and institutional choices; education; advocacy with legislatures and other government leaders; and corporate engagement. Click here to access a .pdf document highlighting the Sisters of Mercy Critical Concerns. The mission of the Conference for Mercy Higher Education is the preservation and development of the core Catholic identity and mission of Mercy higher education in accord with the spirit, mission, and heritage of the Sisters of Mercy. Click here to visit the Conference for Mercy Higher Education (CMHE) website. Click here to visit the Mercy International Centre website.